Good weather prevailed for the Transit of Mercury on 15 November 1999. I took the following photographs of this "grazing transit" using a Ricoh RDC-4200 digital camera (zoomed to 3X) and did some minor editing in GraphicConvertor 3.7.2 (cropping, adjusting levels, and sharpening the image). 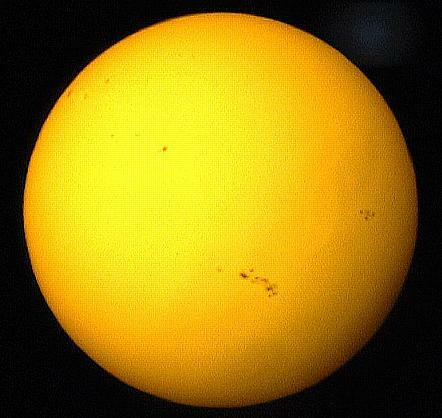 I used my ETX-90RA with the Scopetronix MicroStar II+ and the Thousand Oaks Solar II Type 2 Plus solar filter. 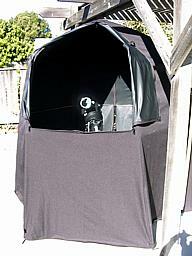 To provide some shelter from the sun I used the Clear Night Products TeleDome Portable Observatory, shown here with the ETX-90RA and Solar Filter. The combination of the ETX, solar filter, MicroStar, and TeleDome made the experience of watching the Transit very enjoyable. Except as noted, all photos were taken with a 20mm eyepiece in the normal position. 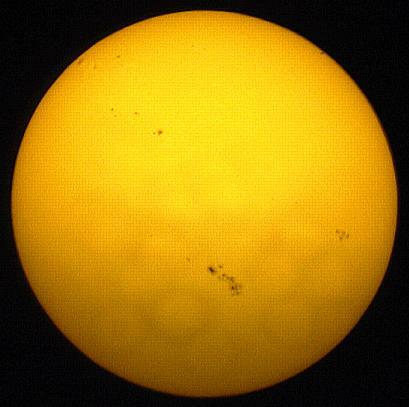 Pre-transit photo of the Sun, showing several Sunspot groupings. Taken with a 40mm eyepiece. Mercury transiting the Sun's disk. Full solar disk, about mid-transit. Taken with a 40mm eyepiece and the Shutan Wide Field Adapter. Mercury is the small black dot in the upper right corner near the solar limb.